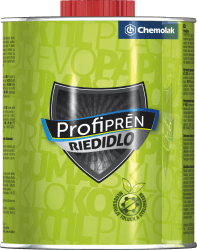 is used for cleaning of glued surfaces, thinning of PROFIPREN adhesives, cleaning of working equipment used during application and removal of glue stains. The thinning is executed by careful adding of the thinner into the adhesive. When the adhesive is applied by spraying, thin the adhesive in the ratio 1 part of adhesive : 0,5 part of thinner.